His university campus is in Victoria's second largest city, Geelong. Geelong is lovely sprawling town on the edge of a bay - the gateway to the famous Surf Coast and the Great Ocean Road - with a country town feel but still all the humming bustle of a big city. There's only one draw back (apart from the up to 5 hour journey by public transport to come home for a visit). It's cold in winter. No, not snow kind of cold, more biting winds straight off the Antarctic. 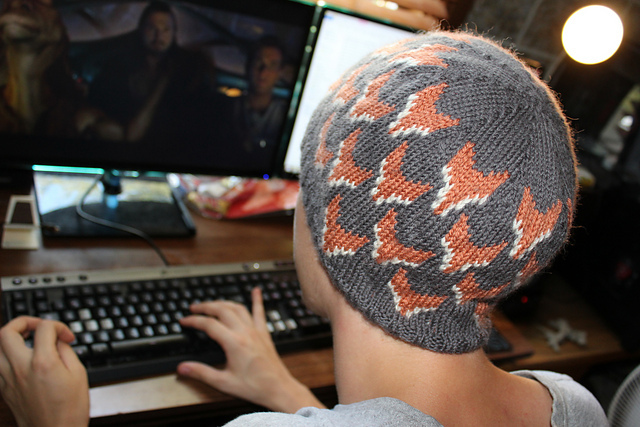 This gives me a valid excuse to knit all the hats for him. 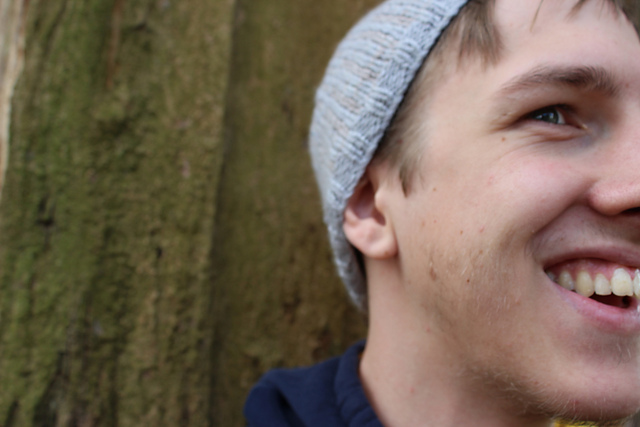 He definitely wears them and appreciates them, both as the edge to an outfit and as a way to keep his ears warm. I love knitting for an appreciative audience - though I may have got a little carried away this year so far. So it's perhaps not surprising that I began my knitter's year of 2016 by casting on a hat on New Year's Eve and finishing it up on New Year's Day. So I got bored. It’s holidays after all and a I needed a small diversion. That’s what a hat is, isn’t it? I can almost knit one in day. This was a little bit of subtle geekery for the boy (He's a massive Dr Who fan) but it’s a tiny bit of a failure. 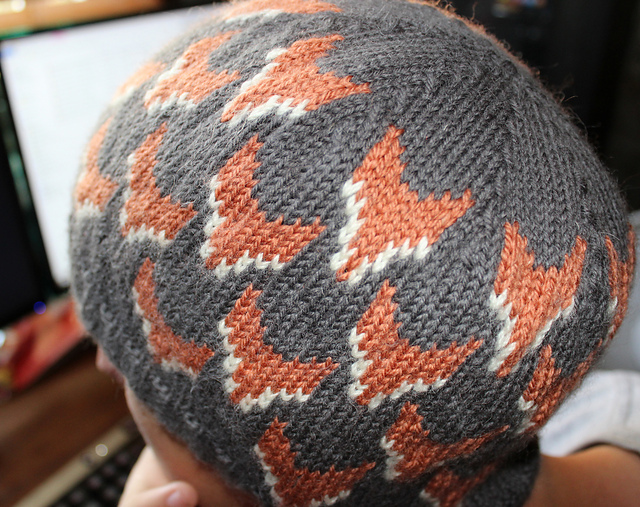 This is a really nice pattern (Thanks Amy!). Well written and easy to follow. Pattern: INSULATE! 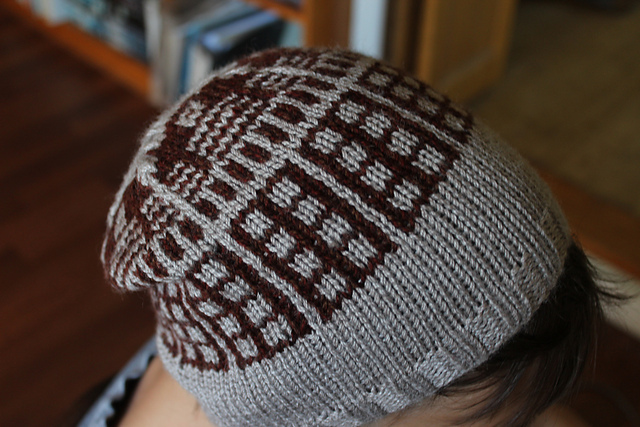 hat by Amy van de Laar - a free pattern. Yarn: Blue grey Machinewash 8 ply from the Lifeline Op shop and leftover Bendigo Woollen Mills Stella in Shell. 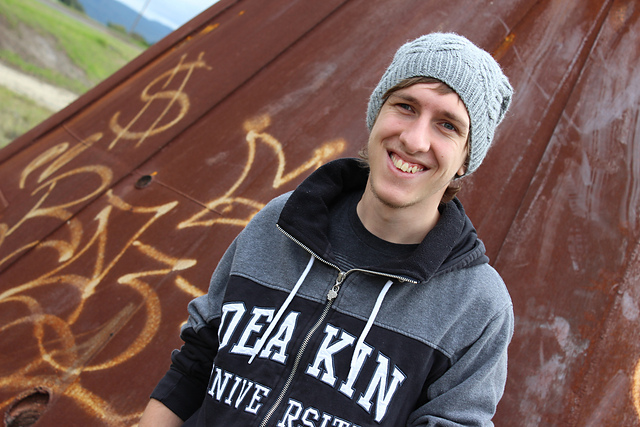 I still had the hat bug in my system though. It clearly wasn't going to be a quick fix this time. 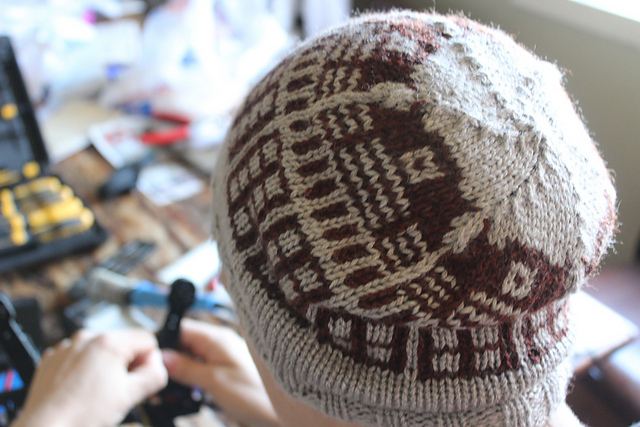 It was about this stage, I hunted down a hat group on Ravelry and decided 16 hats in 2016 was certainly a doable and admirable goal. This flew off the needles (slowly). It only took a week but the three colour rounds of colour work were tediously slow. I’m slightly meticulous about exactly where to carry the yarn on the back to get the best effect on the front and this means concentration, constant untangling of yarn and slow rounds. 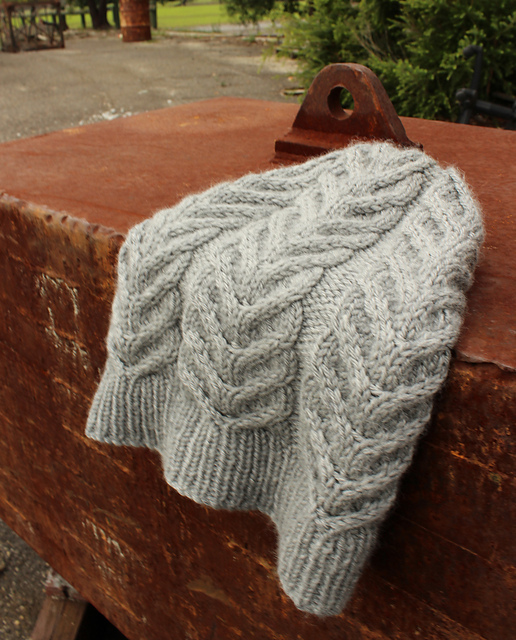 As this is knitted at a very small gauge for DK there were a lot of stitches (144 per round). 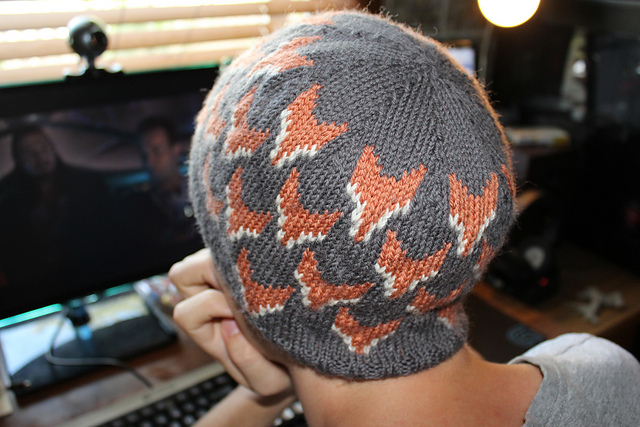 I am really pleased with the result (But I won’t knit this one again - the colour work would get tedious in quantity). The boy tells me it is soooo warm and snugly. 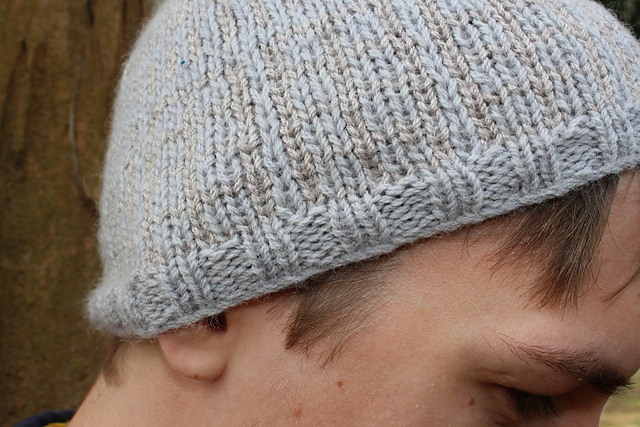 The next hat off my needles for the boy was a re-knit of the INSULATE! hat - Exterminate! 2.0. Yes, I know I’ve made one of these already this already this year. 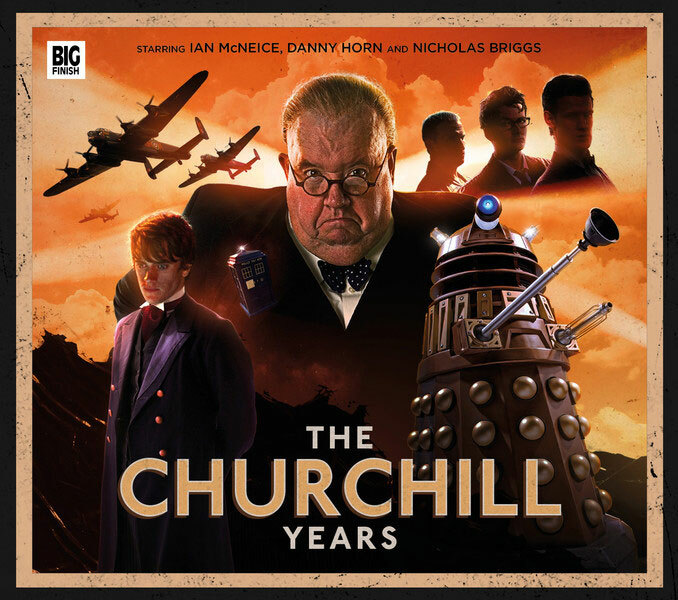 But the contrast between the two greys I used is not strong enough to really see the Daleks. And it’s too much of a watch cap fit to please the boy. He likes slouchy beanies. I needed to make another one. This ended up being the first cast on for Village Hopelessly Over-committed Cast On Month (VHOCCOM12016) on February 1st. 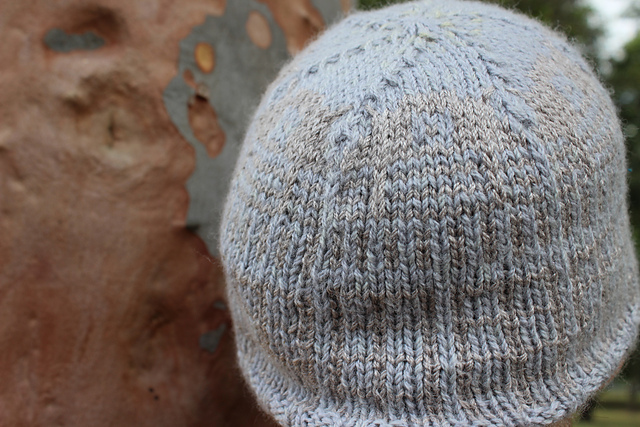 I still want to use the Bendigo Woollen Mills Stellar but as the main colour this time. And after running several potential colour combinations past the boy we have tweedy reddish brown Daleks (Slightly rusty - I think these are the old school Daleks that were conspiring against Winston Churchill in World war II - he called them ‘Ironsides’ - ep 3 season 5 - Victory of the Daleks). I made some modification to the pattern for this version. I did eight rows double rib instead of six as the longer slouch the boy wanted needed a firmer longer band to maintain adequate head connection. 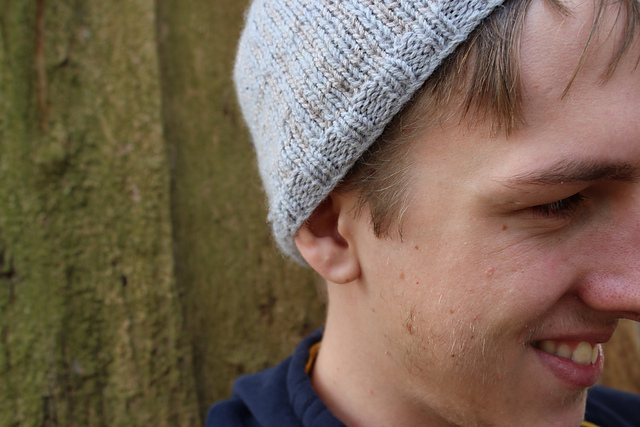 I did fifteen rows of plain stockinette in the MC (grey) before starting the colourwork to extend the hat for some slouchiness and changed the shaping from Slip 2 K PSSO to Slip 1 K2tog PSSO. Yarn: Bendigo Woollen Mills Stella 8 ply in Shell and reddish brown tweed upcycled from the Lifeline Op shop. 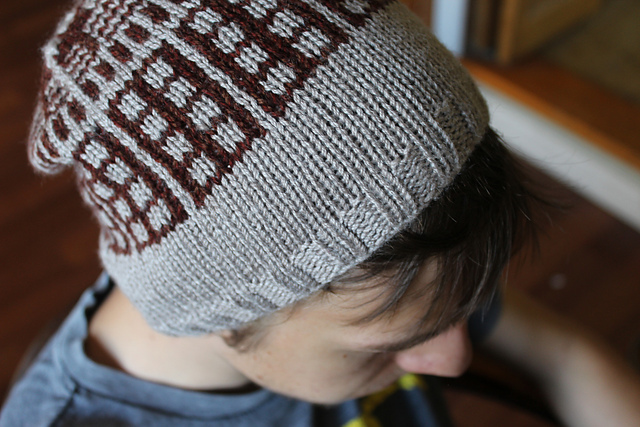 The boy also got the 11th hat off my needles this year as a request. 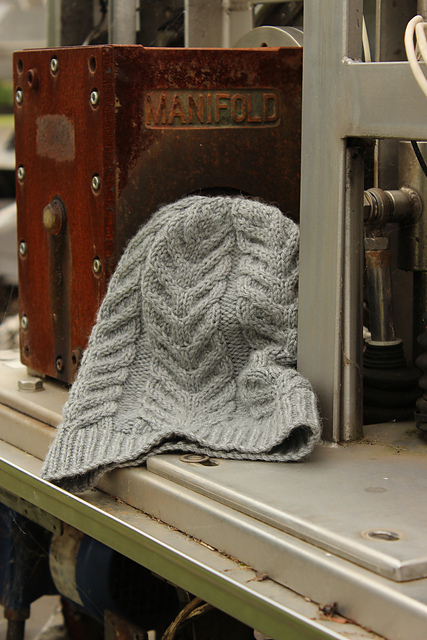 I had previously knitted Father Cables from this yarn (You'll get the see that one in another post). 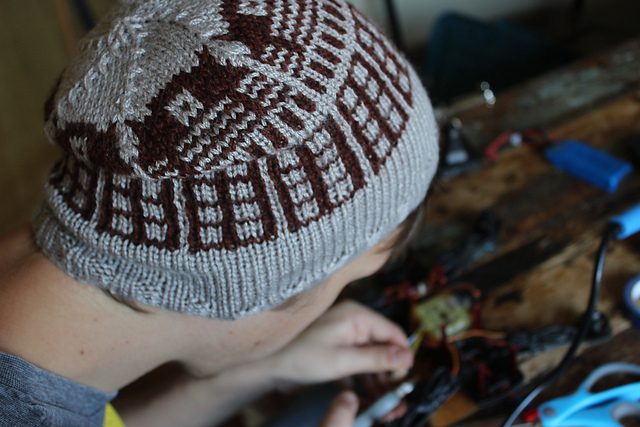 Whilst the boy doesn’t like that particular hat enough to snaffle it - the cables are too elaborate for his taste - he loves the softness and feel of the yarn. So he wanted something suitably masculine made out of this yarn… He also is the person who pointed me towards this particular yarn in an op shop scrounging expedition orginally so he deserved something made out of it. And then I came home and promptly ripped it all back to the rib. I hadn’t changed needle size from the 4 mm used for the band to 5 mm as the pattern suggested as my 5mm dpns are only 20 cm long and I find them a little short to work with comfortably and stitches like to commit suicide by jumping off the end of the needles. So I tend to avoid them if I can. But I needed to up the needle size to accommodate the pull-in of the cables. So I came home and started the patterning again on 5 mm. By the end of Saturday I was back to five completed repeats. 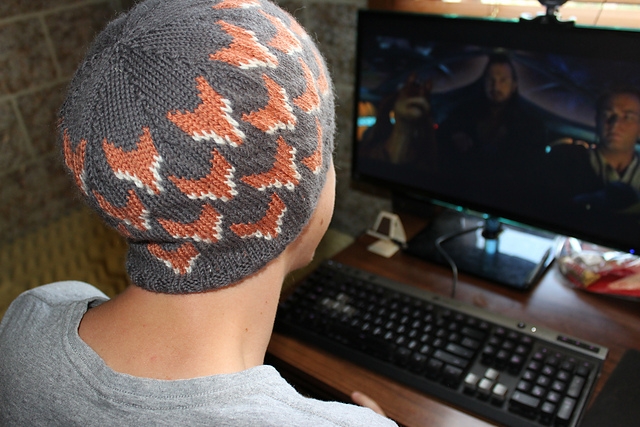 The pattern calls for eight repeats for the small size but I did nine as suggested for the large size as the boy likes a really deep slouch to his hats. This was not promising straight off the needles… Long thin and weird looking. I love what blocking does to this yarn. It makes it bloom and soften till it feels like cashmere. 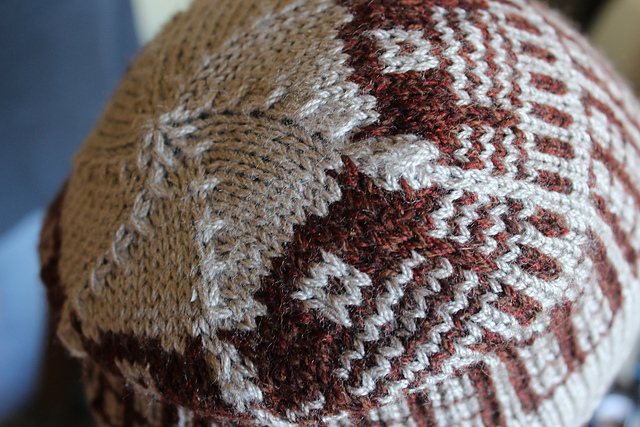 Gorgeous hat in the end. 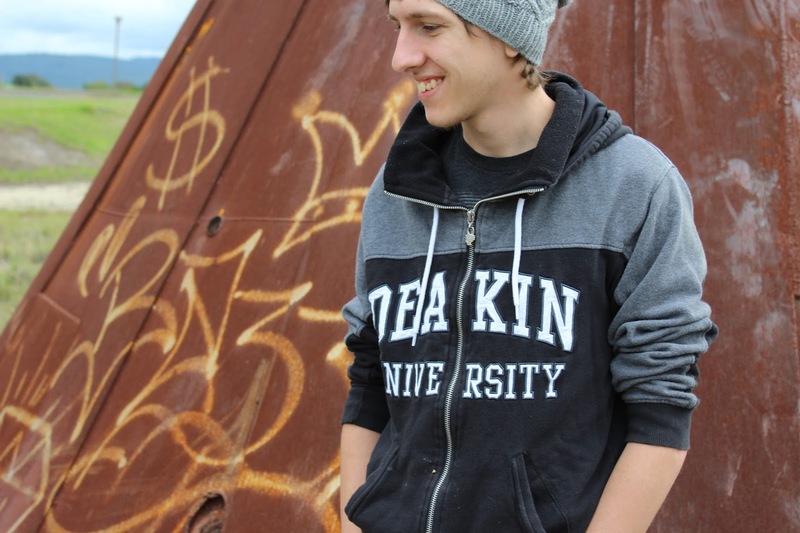 The boy and I shared a lovely photographic road trip last time he was home around some abandoned refuse from the heavy industry in our area taking photos of this hat. Photo credits for the pictures of the flat hat to @larkinsmark (on instagram).